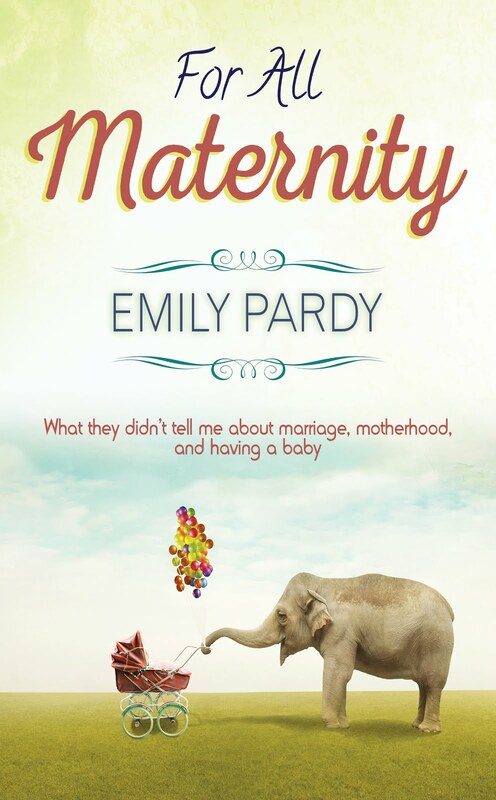 This pregnancy was wonderfully uneventful, but not easy for me. At 34, I physically felt the difference of four years since my last baby. I was also not in very good shape, so the additional 30ish pounds that I lumbered around with seemed extra taxing. While this pregnancy was planned for, I think I underestimated the toll it would take on my body while also raising 2 kids, finishing grad school, and working part-time at the mall. Whew! I did my utmost to appreciate every jab and kick and hiccup in the womb, knowing this temporary discomfort represented a lifetime of joy to come. As with my last two pregnancies, people started asking me if my due date was close when I was only about 20 weeks along. I carry my babies like a beach ball, so my giant belly often bewildered people, as I would tell them how much longer I had to be pregnant. I will admit that I’ve always found this part of pregnancy frustrating and hilarious. I also knew that it was pretty much true since my first baby weighed 8lb. 9oz. and my second was 9lb. 5oz. Chances were good this was no tiny pipsqueak I was carrying! The week before Vivian’s birth was precious to me. I savored little moments with the older girls and sat in the nursery praying over my belly, dreaming of how our family was about to change. My parents made the big drive from Kansas and the night before the birth we got together with my brother’s family (who also live in Nashville) to have dinner together one last time before the big event. While they celebrated with Mexican food I enjoyed a Smoothie King smoothie to soothe my pre-surgery tummy. I couldn’t believe the time had finally arrived. Knowing I was going to go into surgery within hours was nerve-wracking, no doubt. Knowing I was going to have a baby was like anticipating the ultimate Christmas. It was super weird to know I was going to meet her soon. Having gone into spontaneous labor with the previous two, this was a welcome change, but it felt as unnatural as it did peaceful. I was too giddy about meeting her to really be worried about the surgery itself. I knew that as uncomfortable as I was being pregnant, my pain would only increase post-partum before it got better. Still, it was a wonderful change to be able to go to sleep (as restless as it was) and wake up to her birthday. We woke up early and gathered our things. The older girls were insistent on saying goodbye to us, even if it meant waking them. So, even though it was just after 6am, we hugged Matilda and Daphne and bid adieu to our house of four Pardys as we headed for the hospital. Since it was Sunday, the hospital was nearly silent when we walked in. We brought chocolate chip muffins for the nursing staff and quietly filled out paperwork as we put on our wristbands and I changed into the lovely (ha) light blue hospital gown. The nurses were extremely kind and each one of them smiled as we shared in the excitement of our baby girl sharing a birthday with her daddy. We met the anesthesiologist, a few more nurses, and before we knew it the time had come. I was rolled into the OR at 9:14am. Josh was in the hall getting “suited up” in his daddy-hazmat suit, eager to join me. It took 3 tries to insert the spinal block for the surgery (yes, this is as unpleasant as it sounds), but it wasn’t a surprise to me since my previous epidurals took a few tries as well (thanks lower vertebrae!) Within seconds, my lower half was completely numb. Josh came in and sat by my head as the curtain went up in front of our view. The tugging and pulling and pushing of a c-section are not without discomfort. It’s one of the strangest sensations I can explain, being totally coherent and knowing you’re being turned inside out just inches away. We had requested a “family centered cesarean”, and as soon as her head emerged, they announced it was time to drop the curtain. There was no way I could have prepared myself for what came next. “Her head is out. Are you ready to meet your girl?” the doctor asked. I took a deep breath. For some reason, when I imagined this scenario, it all felt very distant from me. I thought about it as if from a third person experience, and only saw the baby as a blurry image. But, THERE SHE WAS. Her little head, held in the hands of the doctor, inches in front of me and coming out of my own body. It was shocking and beautiful and the most exhilarating moment of my life. The curtain and my giant belly blocked the view of anything disgusting (for which I am grateful, as I was a little hesitant if I could handle seeing anything too gruesome) They slowly “walked the baby out” which means they squeezed her slowly through the incision in order to best mimic a vaginal birth and help the infant squeeze out fluids that may have been ingested in the womb (which naturally occurs in a vaginal birth). At 9:46am, she was out. They quickly patted her down, cut the cord, and handed her down to me for immediate skin-to-skin. Vivian was here. My girl was here. She was real and sweet and laying against the outside of my body. I burst into tears. Vivian Margot Blessing Pardy was here. I said her name for the first time to someone other than Josh, and the whole staff starting congratulating us. Everyone was so joyful; it felt like confetti should fall from the ceiling (apart from the fact that my body was totally opened up on the table, so I’m real glad it didn’t). This was the first time I got to be the first one to hold my new baby. In the past, they had always handed the baby to Josh for father skin-to-skin time. But, this time, this hospital offered to let me hold her first and I jumped at the chance. It was magical, to say the least, and nothing comes close to that feeling. I was stitched up and Vivian was weighed and measured. They transferred me to another bed and minutes later I was holding my precious baby again, getting rolled down the hallway to recovery, ready to show my little love to the world that awaited. We passed by nurses and doctors and I was filled with so much love and joy that it honestly felt like my own little private parade (if I lived in a musical, this is the part where nurses turn into dancers and the doctor bursts into song). We made it back to our recovery room where we swooned over our new bundle of joy and gathered our thoughts into words that didn’t hold a candle to the fireworks of feelings we held inside.